We’re looking for talented, friendly trainers who have a passion for fitness and motivating others to reach their fitness goals. 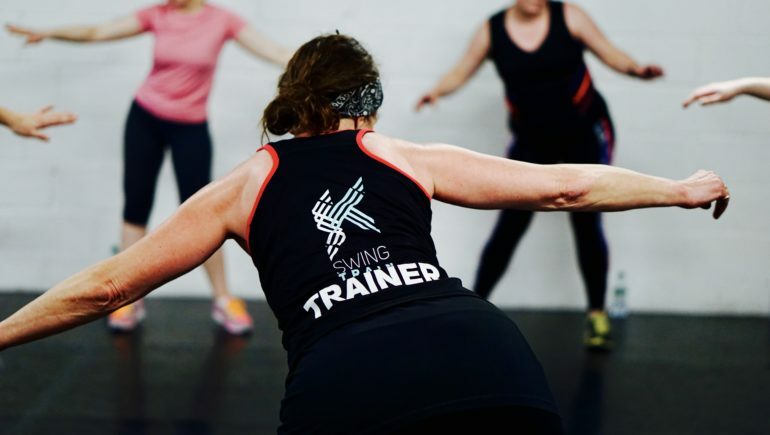 After training, our trainers have everything they need to set up their own SwingTrain classes and run them as their own small business with support from SwingTrain HQ. We offer training in the SwingTrain choreography and teaching styles, equipping you with the tools you need to teach you own classes. Over the course of the day, you’ll learn the choreography for all the songs that make up a one hour SwingTrain class as well as teaching techniques that will help you keep your participants motivated and wanting to come back. At the end of the day, there’ll be an informal assessment with groups of your fellow classmates that will look at your ability to pick up the moves and communicate with the class. Once qualified, you’ll be eligible to teach SwingTrain classes in your chosen area. or if you prefer, email us at info@swingtrain.com. Know someone who would be perfect? Recommend a friend and they’ll receive 20% off their training and you’ll receive £15. Check out our upcoming training days below! Can’t make it to one of our SwingTrain Training Days? Not to worry, train remotely today and run your own business tomorrow!